Debar is a small town of around 10,000 citizens, located in the southeast part of the field of Debar, at an altitude of 625 meters above the sea level. 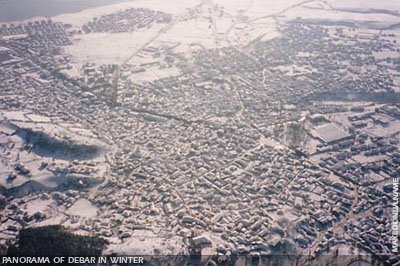 Debar is located on 131 km from the capital Skopje and from the nearby town Gostivar, is just 71 away, while from Struga is 52 km away. Debar was referred to for the first time on the Ptolomeius map in the 2nd century, under the name of Deborus. In the 11th century, according to the documents of Vasilius 2nd, the town belonged to the bishopric of the Bishop of Bitola. 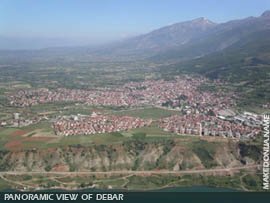 In 1449, Debar fell under Turkish power and was named Dibri or Debra. In the 15th century, Debar was known for being the town of rebellions against the Turkish sultan, but at the same time, for the wealth of the numerous Turkish Aga and Bey who used to live there. At that time, Debar became a significant urban centre with a developed crafts industry and trading centre, through which numerous traders and travelers passed. In the town centre, was the Bazaar with a lot of shops and crafts workshops. The town streets were narrow and curved, and typically for an Islamic town, it possessed a high number of inns. Many houses were built in this period and some of them have been preserved to the present day. The houses are distinctive in their original architecture and the internal organization of the rooms equipped with "dolapi" - wardrobes, "minderlaci" and carved "cardaci" (that is the enclosed porches on the second floor of a Turkish house), ceilings and doors. The town was divided into Upper Debar and Lower Debar, in this period. The most reputed craftsmen, builders and carvers were of Debar origin. During 19th century, Debar is known for its rebellions against the Turkish Sultan as well as its richness. 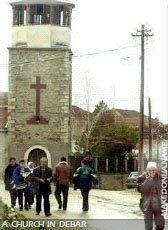 In the first half of the 19th century, the traveler Ami Bue has observed that Debar had 64 shops and 4,200 residents. By the end of the century, the town had 15,500 residents but after World War I, this number started to decline. The ethnical structure in Debar has changed during the second World War, which in that period was occupied by the faschist Italians (later Albanians). Then the many Macedonians, frightened of the terror of the Italian (later Albanian) occupator (known as Šiptar, Balist), left and settled in Skopje (in the known Debar Maalo - Debar Neighborhood). Today in the entire Debar district (municipality) live around 17,000 citizens, while in Debar there are no more than 10,000. Of them 62,5% are ethnic Albanians, 21% Macedonians, 13% Gypsies and the rest of it, Turks and others. There is a factory "Knauf", that hold's 120 employees. 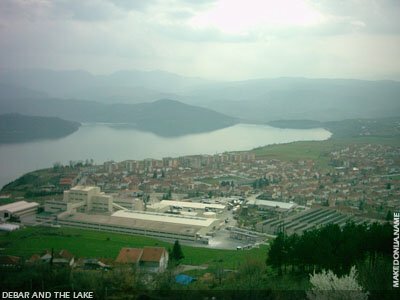 Near Debar, there are the strong springs of the Banjiste spa and the creation of the artificial lake, has greatly enhanced the attractiveness of the area. In immediate vicinity of Debar, along the course of the rivers Radika and Crni Drim, travelers may enjoy the vivid scenery.